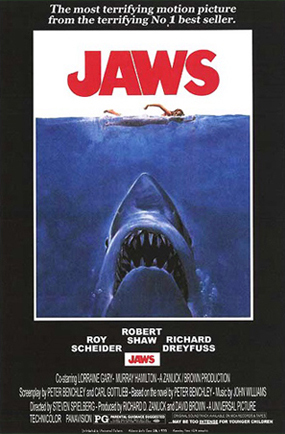 This entry was posted on Friday, October 23, 2015 and is filed under Classic,Friday Flicks,Horror,Jaws,Movie Review,Peter Benchley,Sharks,Steven Spielberg. You can follow any responses to this entry through the RSS 2.0. You can leave a response. This is a movie I have seen! I want to read the book though because that is something I haven't done. I would agree with you by saying that the imagination is a key factor here. Oh, and the music. The music really contributes to that suspenseful build up! Agreed! I've actually got the book on my kindle, so hopefully I'll get around to reading it. I've never read Jaws though I've always intended too. I've always loved the film version though it's been many years since I've watched. I really should rewatch it!! I'm always amazed at how many of my favorite movies were actually books. I definitely intend to read this one soon!